DirkMD - CMIO Perspective: An Opinion : What exactly are "Protocols" and "Standing Orders"? An Opinion : What exactly are "Protocols" and "Standing Orders"? 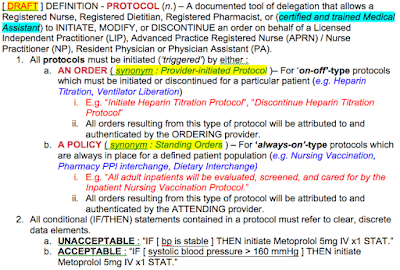 Protocols and standing orders. Next to order sets, these are two of the most ubiquitous tools in modern healthcare, used to create predictable routines and outcomes in clinical care. So what exactly are they? 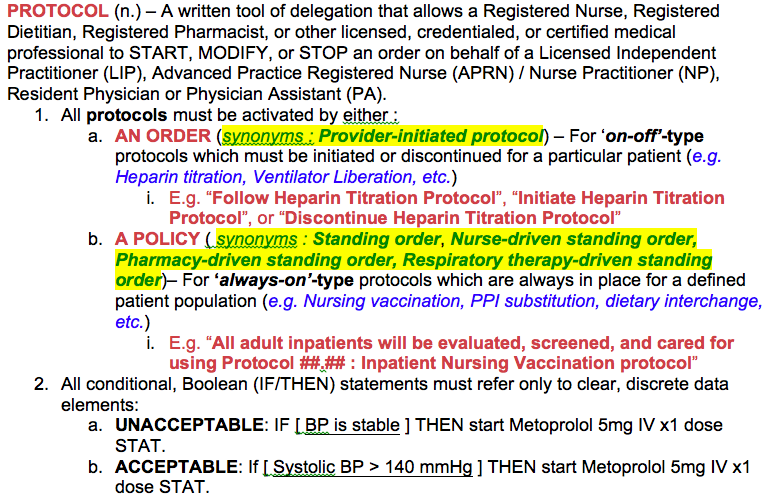 And what exactly is the difference between a "protocol" and a "standing order"? For the Informaticist, these are not easy questions to answer. The confusion starts with the search for regulations and definitions, where there is a curious paucity of information. As of this writing, most major regulatory bodies have somewhat vague or conflicting information. Historically, it seems many regulatory bodies simply frowned upon the use of "protocols" or "standing orders". Why? Probably because of their function - If a doctor writes an order like "Vent liberation per protocol", he/she is actually asking someone else to take on the responsibility of managing a ventilator on his/her behalf. So it's actually a tool of delegation. 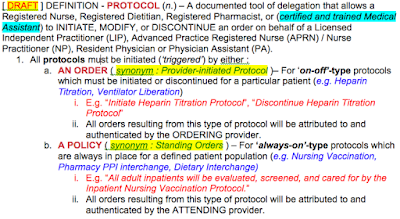 By using "per protocol", does the order actually refer to a approved, documented set of well-defined, clear, reasonable, evidence-based, and agreed-upon instructions? If a nurse, pharmacist, or someone else can follow those instructions - What if something doesn't go according to plan? Would the nurse, pharmacist, or other care team member have the same skills and training as the doctor to manage any unexpected outcomes or scenarios? If the doctor is effectively unaware of the minute-by-minute details of what the nurse or pharmacist is doing, or the patient status, will the doctor still be responsible for the outcome of their pre-defined instructions? Or will the nurse or pharmacist be responsible? How do we know this delegation agreement was clear, effective, and appropriate? So for many years, many of those regulatory agencies were concerned and understandably frowned upon the use of protocols and standing orders. Not enough was known about them, and the risks seemed to outweigh the benefits. And let's face it - If it's a tool of delegation, what's to stop a doctor from writing the "Dr. ______-is-away-this-weekend-protocol", making the nurses shoulder all of the responsibility for care? Hospitals may adopt policies and procedures that permit the use of standing orders to address well- defined clinical scenarios involving medication administration. The policies and procedures must address the process by which a standing order is developed; approved; monitored; initiated by authorized staff; and subsequently authenticated by physicians or practitioners responsible for the care of the patient. The specific criteria for a nurse or other authorized personnel to initiate the execution of a particular standing order must be clearly identified in the protocol for the order, i.e., the specific clinical situations, patient conditions or diagnoses in which initiating the order would be appropriate. Policies and procedures must address the education of the medical, nursing, and other applicable professional staff on the conditions and criteria for using standing orders and the individual staff responsibilities associated with their initiation and execution. An order that has been initiated for a specific patient must be added to the patient’s medical record at the time of initiation, or as soon as possible thereafter. 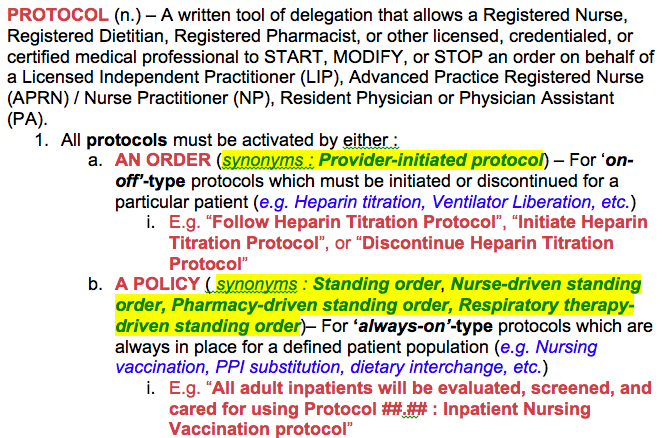 Likewise, standing order policies and procedures must specify the process whereby the physician or other practitioner responsible for the care of the patient acknowledges and authenticates the initiation of all standing orders after the fact, with the exception of influenza and pneumococcal polysaccharide vaccines, which do not require such authentication in accordance with §482.23(c)(2). The policies and procedures must also establish a process for monitoring and evaluating the use of standing orders, including proper adherence to the order’s protocol. There must also be a process for the identification and timely completion of any requisite updates, corrections, modifications, or revisions." This was a big step forward in creating some clarity around the subject of "standing orders", but does this also apply to "protocols"? It seems there is still a great deal of confusion over this issue. Articles like these : https://www.medscape.com/viewarticle/775617 suggest that people are still trying to understand if these are legal, and if so, how to design them safely. "Is it the same as an oncology protocol?" These are not easy questions to answer when the regulations and definitions don't guide you very well. So what is an Informaticist to do to help resolve the issue? Focus on the function, and work backwards to redefine the archetype and definition! The terms "Protocol" and "Standing Order" are almost used interchangeably - But not quite - So they still must have some kind of relationship. They seem to allow someone else than the provider to enter, modify, or stop an order, on behalf of the provider - so they appear to be some kind of tool of delegation. They seem to follow some kind of documented instructions, explaining exactly WHICH order(s) to start, modify, or stop, and when. For safety, the reasons that someone else is starting, modifying, or stopping an order should be very concrete and clear, without need for interpretation. 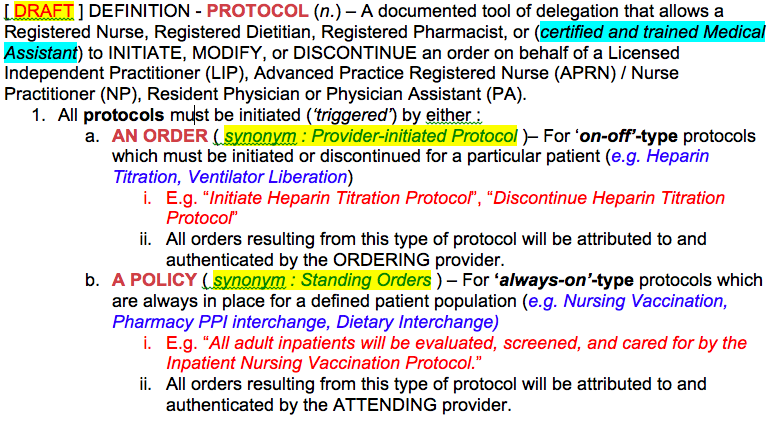 [ DRAFT ] DEFINITION - PROTOCOL (n.) - A tool of delegation that allows a __________ to INITIATE, MODIFY, or DISCONTINUE an order on behalf of a Licensed Independent Practitioner (LIP), Advanced Practice Registered Nurse (APRN) or Nurse Practitioner (NP), Resident Physician, or Physician Assistant (PA). 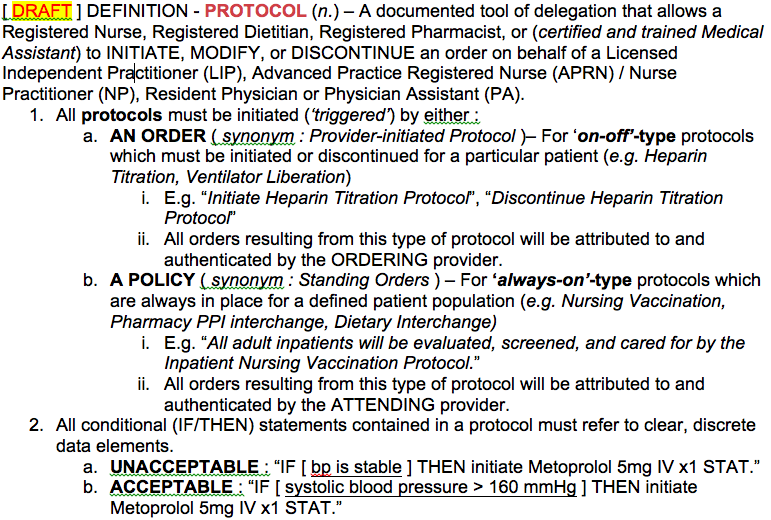 [ DRAFT ] DEFINITION - PROTOCOL (n.) - A tool of delegation that allows a Registered Nurse, Registered Dietitian, Registered Pharmacist, Registered Respiratory Therapist, (or certified and trained Medical Assistant) to INITIATE, MODIFY, or DISCONTINUE an order on behalf of a Licensed Independent Practitioner (LIP), Advanced Practice Registered Nurse (APRN) or Nurse Practitioner (NP), Resident Physician, or Physician Assistant (PA). This is a pretty good start, but let's see if we can help craft some additional functionality and safety into this definition. 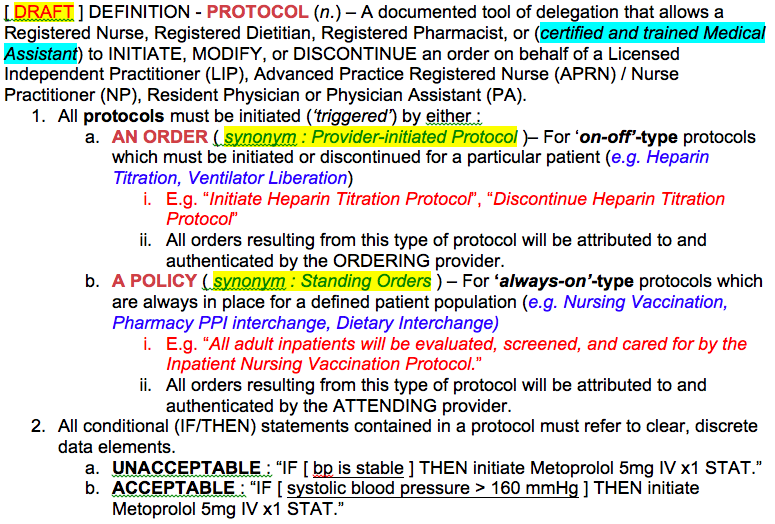 [ DRAFT ] DEFINITION - PROTOCOL (n.) - A documented tool of delegation that allows a Registered Nurse, Registered Pharmacist, Registered Dietitian, Registered Respiratory Therapist, (or certified and trained Medical Assistant) to INITIATE, MODIFY, or DISCONTINUE an order on behalf of a Licensed Independent Practitioner (LIP), Advanced Practice Registered Nurse (APRN) or Nurse Practitioner (NP), Resident Physician, or Physician Assistant (PA). All protocols are categorized as either : A. Protocols that apply only to a specific patient, or B. Protocols that apply to a defined population of patients. 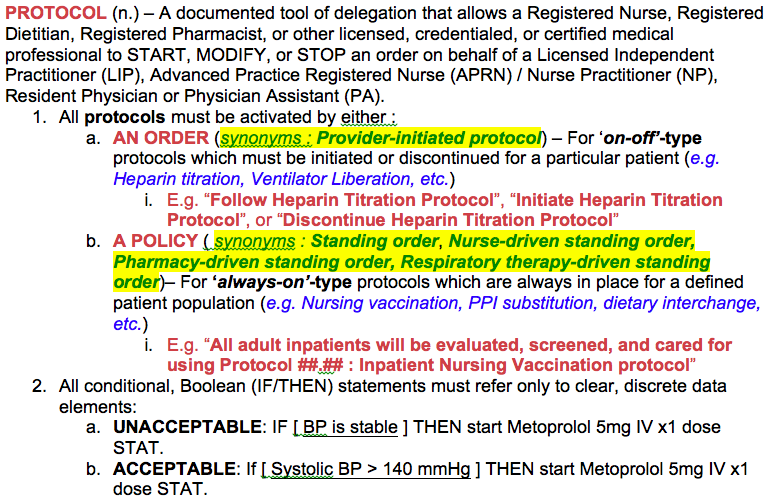 So if a protocol only applies to a specific patient, there must be some way that a provider can specify which patient(s) to use the protocol on - A way of turning the protocol "on-and-off", to tell a nurse when to follow the protocol, and when NOT to follow the protocol. Likewise, for those protocols that apply to a defined population of patients, there must be some way to define which population of patients the protocol should be applied to. But if it's a protocol that is 'always on' for a defined group of patients (say, adult inpatients), then a handy 'trigger' could be a POLICY, e.g. "All adult inpatients will be on the pharmacy PPI substitution protocol" that allows a pharmacist to STOP one PPI and START another PPI (to replace one for the other). So this is a reasonable starting point. But does this help us, yet, with a definition for "Standing Order"? I think it does - The term "Standing Order" is commonly used to describe scenarios where the provider has granted pre-approved, written, delegated authority to perform an action without their input or awareness. This is especially helpful in common scenarios where the risks/benefits of administration outweighs the risks/benefits of getting a provider order - E.g. For Public Health reasons, many states allow Registered Nurses to order and administer (low-risk) vaccinations without a provider's input. This leads me to ask about other common terms/synonyms - E.g. 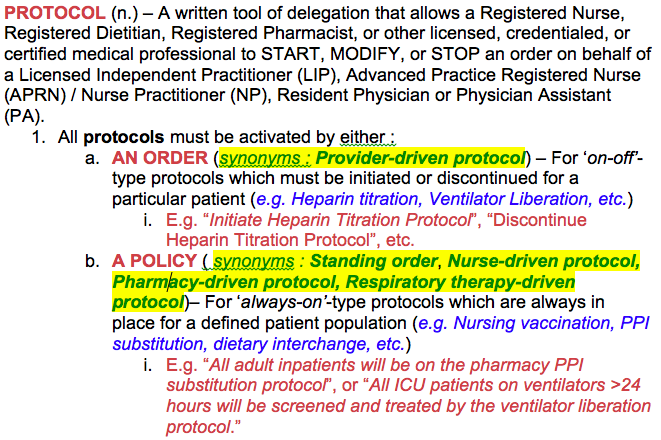 "Nurse-driven protocol", "Pharmacy-Driven Protocol", "Respiratory Therapy Protocol", etc. What exactly are these? This definition is much more robust than many regulatory agencies currently offer or publish. Some might see the adoption of such a definition as risky ("You don't want to paint yourself in a corner!") - However, it does provide a great deal of clarity and predictability, and if it exceeds the expectations of the regulatory agencies, then you are still meeting their expectations while simultaneously creating clarity and predictability - Which creates more predictable outcomes, which can lead to faster development time, higher development standards, and more standardized care. Before deciding whether or not to adopt such a definition and approach in your organization, your legal counsel, senior leadership, and informatics leadership will need to discuss the risks and benefits in detail. Q : "What exactly is a protocol?" Q : What exactly is a standing order? A : It is a PROTOCOL which is activated/triggered by a POLICY. The provider is not required to initiate action, and child orders are attributed to the ATTENDING provider. See the definition of PROTOCOL, section 1.b above. Q : Do I always need to activate a PROTOCOL with an order? A : No - See the definition of PROTOCOL, section 1.b (aka 'Standing Order'). Q : Is a PROTOCOL the same as a 'research protocol'? A : Without a solid definition of 'research protocol' it is not easy to answer this, but research protocols are typically used to guide the screening of research subjects, plan their data collection and management, with the goal of studying a subject. A PROTOCOL is only used to define a common clinical scenario where a licensed prescriber is delegating the authority to start, modify, or stop an order on his/her behalf. Q : Is a PROTOCOL the same as an 'EMS protocol' or 'Emergency Protocol'? A : Without a solid definition of 'EMS protocol' or 'Emergency Protocol', this is difficult to answer concretely - But in fact, many state EMS protocols have the same sort of functionality as a clinical PROTOCOL - Allowing a trained medical professional (paramedic or EMT) to initiate care in the field, on behalf of a supervising Emergency provider or Medical Director. In my next blog post, I'll show how such a [ DRAFT ] definition could help you develop a protocol template that supports your protocol definition by creating an easy way for your protocol-builders to plan and build a professional-looking protocol document that supports your desired workflow and EMR configuration. Remember this blog is for educational discussions only - You should consult your own legal counsel, senior leadership, and informatics professionals before considering adoption of any of the above approaches or definitions. Have any good definitions or regulations to share, or other ideas or comments? Leave them in the comments box below! What exactly is a "Nursing Policy"?